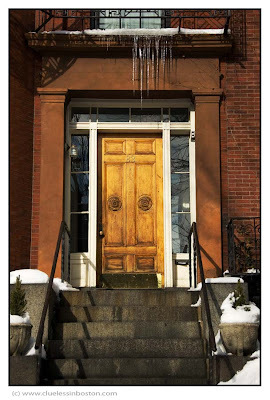 Beacon Hill doorway, with icicles. Gorgeous shot! Love the icicles. I can see a Poster of your doorways in my mind's eye, lol. i love great doorways. Nicely done. Your other photos of Boston are excellent also. I really enjoy Boston and will look forward to more great photos. Better wear an helmet if you need to ring that doorbell!! !